REPORTER FILE PHOTO | A view of the entrance to St. Gabriel’s Retreat Center. REPORTER FILE PHOTO | Councilman Peter Reich, Town Board liaison to the Waterways Management Advisory Council. JULIE LANE PHOTO | The future of La Maison Blanche hangs in litigation between the two men who opened the business together in 2010. The ongoing legal fight between John Sieni and Alistair MacLean over the future of La Maison Blanche took another turn this week. State Supreme Court Justice Thomas Whelan’s granting of a cautious preliminary injunction stops Mr. Sieni from dissolving the limited liability corporation the two men formed three years ago to operate the hotel and restaurant. The corporation, called JAMSFAB, has a five-year lease to use the property owned by Mr. Sieni’s JBS Properties for the purpose of the business operation. To dissolve JAMSFAB the court would have to find that it wasn’t practical for the business to continue. That was something the judge said company records didn’t uphold. He also said the operating agreement between the two partners had no provision for expelling a member of the limited liability company. At the same time, the judge is requiring Mr. MacLean to post $100,000 within 45 days from the June 20 decision with the understanding that if it’s finally determined that he wasn’t entitled to the preliminary injunction, he would be liable for all damages and costs that resulted from its granting. Various suits and counter suits have been filed by the two men since Mr. Sieni — who owns 70 percent of JAMSFAB to Mr. MacLean’s 30 percent interest — fired his business partner. The split between the two partners last November was characterized as a “business divorce,” by Michael Walsh, Mr. Sieni’s attorney. He was fired December 12, 2012. Mr. MacLean subsequently denied all charges while Mr. Sieni maintained the business sustained losses in 2011 and 2012 because of Mr. MacLean. Mr. Sieni sought support from the courts for his action in firing Mr. MacLean. Despite the firing, Mr. MacLean has maintained he’s still listed as a partner in the business on documents filed in Albany and on the company’s liquor license. On July 15, Mr. Sieni is due to answer questions from the New York State Liquor Authority pertinent to renewing his liquor license that still lists Mr. MacLean as a co-owner of the business. There were subsequent complaints Mr. Sieni tried to enter into the court record that the judge rejected because of what he said was a faulty amendment to the original petition. 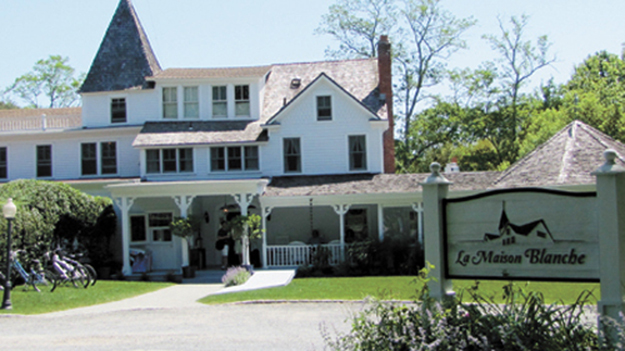 The attempted amendment, referred to in the judge’s decision, charged that since the split between the two, Mr. MacLean had taken other actions aimed at damaging the business, including, “making unsubstantiated complaints” to the Shelter Island Building Inspector alleging zoning code violations; to the Suffolk County Department of Health Services alleging sanitary code violations; and to the Fire Marshall alleging violations of the state uniform fire prevention and building code regulations. Both men are claiming elements of victory in the decision and both plan to go forward with pending litigation. They are due back in Supreme Court in Riverhead on August 9 for a preliminary conference on the case Mr. MacLean has filed against Mr. Sieni claiming he was “wrongfully ousted” from the business. Mr. Sieni has had the building on the market for several months at an asking price of $3.5 million. But Mr. MacLean maintains no sale can occur because he has a lien against the property. Not so, according to Mr. Walsh, Mr. Sieni’s attorney.